While billed as a civilian venture, the satellite launch by Japan and South Korea has military implications. 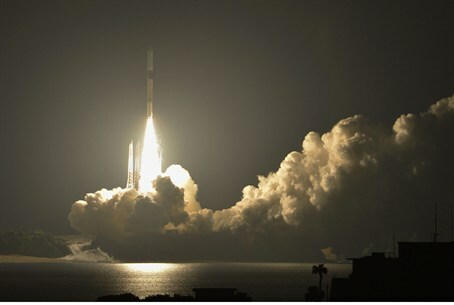 Two days ago, the Japanese space Center at Tanegashima launched a Japanese rocket carrying a sophisticated South Korean satellite. The launch was a success and both countries are very pleased with the results and their implications. South Korea chose the Japanese for a launch because the offer was lower than the competing Russian bid. Both countries stressed the civilian aspects of the launch. Japan would like to be a player in the launch business, while South Korea joins the club of countries who have manufactured multipurpose earth observation satellites-- a club that also includes the United States, the EU and Israel. The resolution of the space cameras allows the satellites to capture objects as small as 1 m in length. According to the South Koreans, they are interested in gathering geographical information, developing natural resources and preparing for natural disasters. Japan and South Korea protest too much. One South Korean paper printed a glowing report claiming that the satellite will be able to monitor the movement of trucks from space - before remembering that the official goal was developing natural resources and warding off disasters. The Japanese also emphasized the economic implications of a successful space launch business. With the exception of stating that the satellite was not intended to spy on any particular country, the North Korean elephant in the room was ignored. Japan and South Korea both protested the planned and ultimately failed launch of a North Korean missile, presumably carrying a civilian satellite. The North Koreans claim their space program is purely scientific, a claim that was met with derision in Tokyo and Seoul. A country that possesses the ability to launch a satellite can also launch a missile with a different payload and target it quite accurately. The South Koreans, for their part, have a satellite that can accurately monitor North Korean movements. Another important development is the cooperation between Japan and South Korea involved in this project. Due to the history of Japanese occupation of Korea, ties between the two countries have always been sensitive. North Korea has brought these two countries together with its belligerent posture and nonconventional weapons programs.